The lake's long Native American name has been translated as Smile of the Great Spirit. The largest of the lakes in New Hampshire's Lakes Region 95 miles (153 km) north of Boston (map), Lake Winnipesaukee is grand indeed: 2 miles (34 km) long, about 288 miles (463 km) of shoreline, 69 square miles (179 square kilometers) of water to swim in or boat on, 212 feet (65 meters) deep at its deepest point, and boasting 258 islands. Named for the Winnipesaukee sub- tribe of the Penacook Native American tribe, the name of this glacial lake has been translated as Smile of the Great Spirit, and while the lake's irregular shoreline might suggest a wry grin rather than a sunny smile, the lake's large size would certainly do the Great Spirit justice. Summer is when the lake is busiest with swimmers, boaters, fishers, water-skiers and the like, but winter snows draw crowds to the Gunstock Mountain Ski Resort in Gilford near the lake's shore. 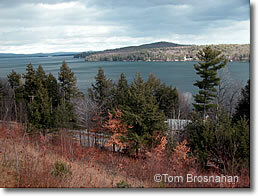 The lake's favorite towns are Laconia, Weirs Beach and Wolfeboro. The "Smile of the Great Spirit."